Performed at the Théâtre Antoine for two seasons. 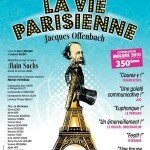 National French tour plus Switzerland and Belgium and then reprise at the Théâtre de Paris. Nominated « Best Musical » at the Molière Awards in 2010. I played the rôle of the Baroness de Gondremarck, the Swedish aristocrat visiting Paris. And I also played the flute throughout the show as well.